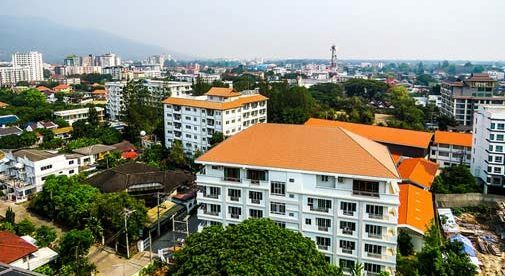 Chiang Mai is a low-cost retirement destination that is rich in cultural and foodie experiences. Chiang Mai, a Northern City of Thailand was the perfect place for intrepid travelers Nancy Fornier and her husband, Keith McCoy, to set up a base for their retirement dream of further travel and exploration. The couple were researching Ecuador as a retirement destination, and stumbled upon Thailand, and in particular Chiang Mai. “We decided to check out Chiang Mai on our yearly holiday. We talked to real estate agents and visited the malls and looked closely at day-to-day living,” says Nancy. There was one factor that swayed the couple in the direction of Chiang Mai. “The big thing was cost of living. If we compared Ecuador to Chiang Mai, it looked a little bit cheaper,” says Nancy. The couple from Orlando, Florida first lived in a modern, chic city condo but then decided to move into a spacious three-bedroom townhouse just a mile from the city. They only pay $650 per month. The condo was 72 square feet and the couple felt they needed more space. Moving into a townhouse in a gated community, with a lap pool and gym meant that they had an extra 48 square feet of space and saved $350 per month. Nancy and Keith are ‘foodies’ and love cooking for friends, so a fully-functioning kitchen was a deciding factor on which property they would choose to rent long-term. “Our townhouse is spacious and we have a modern kitchen; an oven, as well as a four-burner gas stove, and a double sink. I also prefer it because it is quiet and peaceful on the periphery of the city,” says Nancy. The couple advise that renters should experience different parts of the city short-term before they take out a long-term lease. “I would recommend being closer to the city because there are so many things to see and do. And you are closer to walk to places. A lot of expats don’t get cars, so walking distance is important,” says Nancy. The convenience of living close to the city is also advantageous as there are hundreds of restaurants in and around the Old City. The choice of international cuisine is abundantly accessible and very affordable. “We went to the food truck market last night called Ploen Ruedee. There is a place that we found where we can get a burger for $2.” Eat in, eat out, it’s the best of both worlds in Chiang Mai, Thailand.